Long before there was the red sole or the incredibly weightless BB, there was the buckle. Known as the Fabergé of Footwear, French cobbler Monsieur Roger Vivier first invented stiletto heels back in the fabulous fifties. Fast-forward to 2003, French-Italian designer Bruno Frisoni took over the reins and revamped the brand. 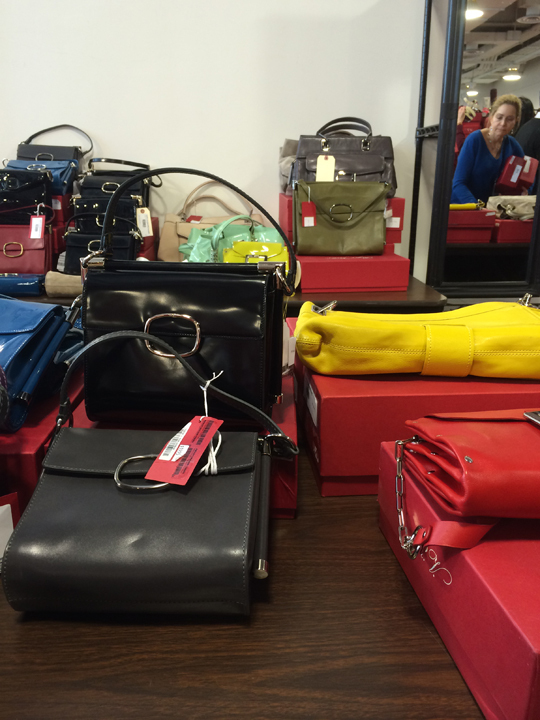 Today, La Maison Vivier has a fanatical cult following and today's sample sale was proof. Even though I expected an outrageous turnout, I was still impressed when I arrived at the sale this morning and saw the 100 or so early bird shoppers (some waiting in line as early as yesterday evening) queued up in front of Soiffer Haskin. By 8:30am, the line had stretched beyond 9th Ave and had approximately 400+ people shivering in the cold. Mercifully, the doors opened an hour earlier than scheduled at 9am. 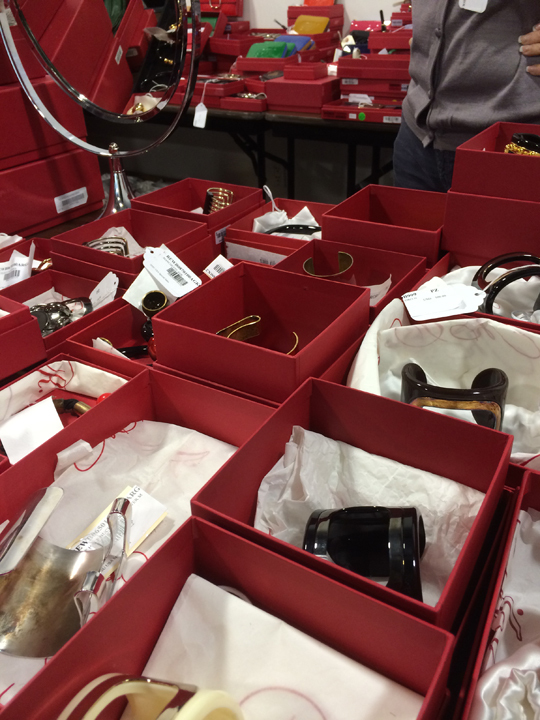 After a quick mandatory coat check, I entered the sale space and headed right towards the iconic buckles and red boxes. 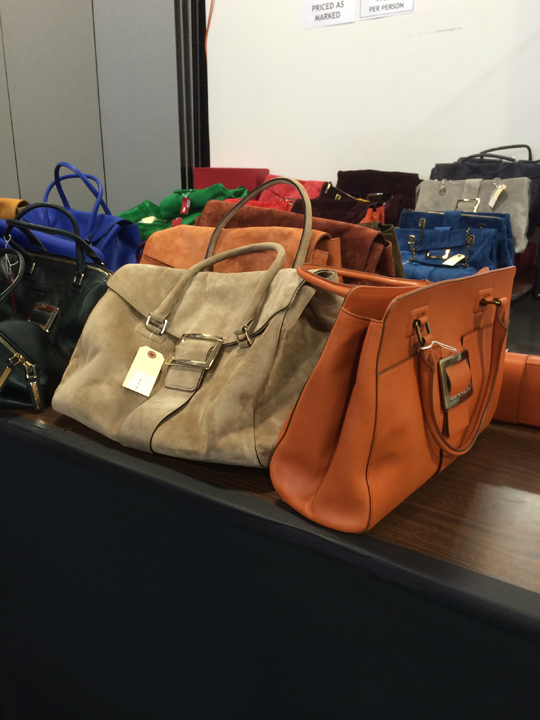 Prices didn't seem to differ much compared to last year with most buckles on sale between $300 and $350. But I did notice a glaring difference in the availability of sizes. 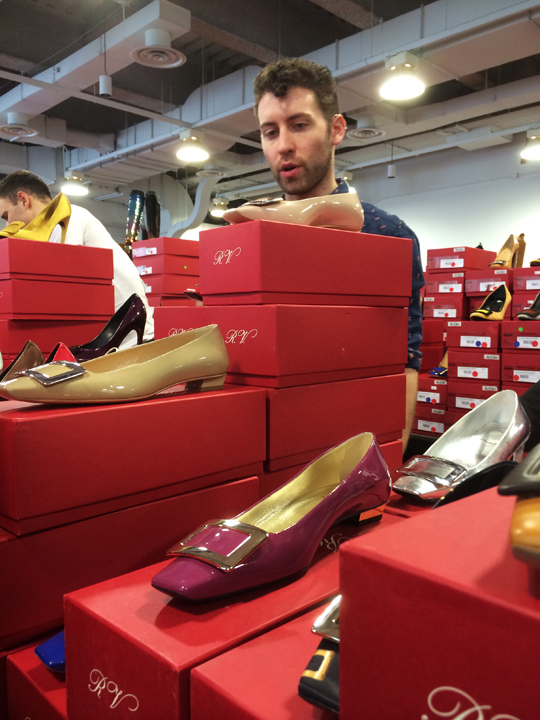 Though I spotted Decollete pumps, Belle Vivier flats, Belle De Nuit pumps, Gommette ballerinas, and d'Orsay flats, the chances of smaller sized shoppers finding a fitting pair of shoes proved to be nearly impossible. Almost all buckles in size 38 and below were gone by the time I made it in. And it's not like I took my sweet time getting up this morning. 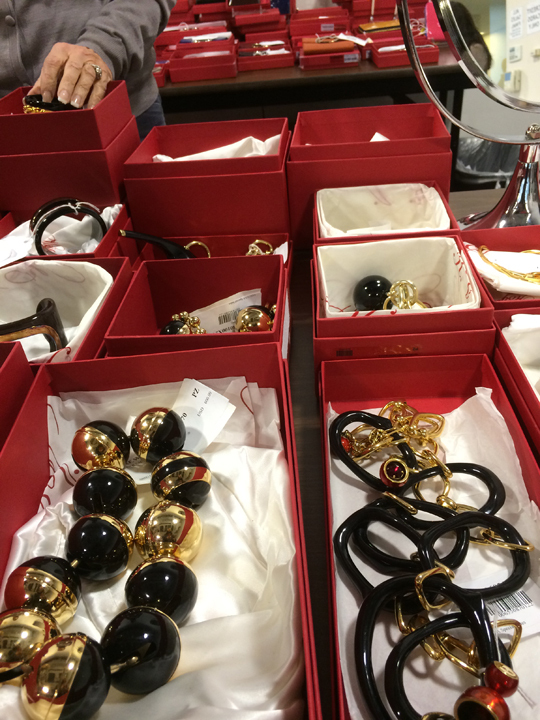 It was quite the contrary as I was part of the first contingent of shoppers let inside the sale. Therefore, I was seriously disappointed when I learned of the short supply of sizes compared to the wealth in various styles of shoes that were on hand. And so, I moved on. Unlike the footwear, the handbag section proved to be more interesting than I expected. 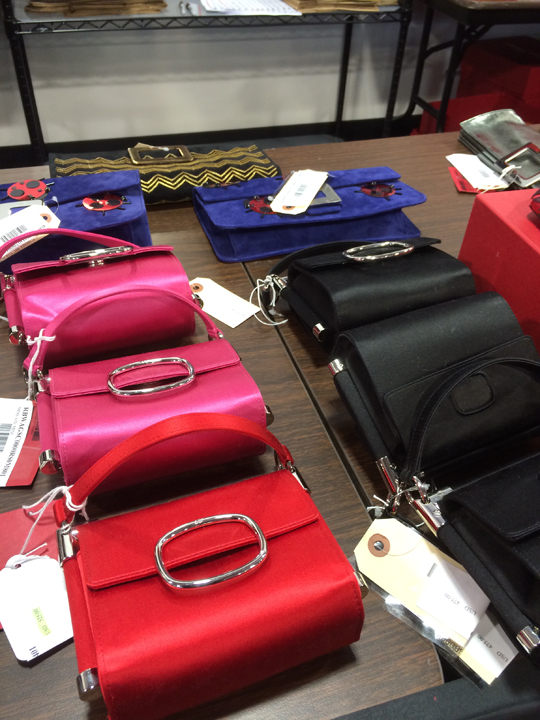 Though I didn't find any Prismick totes, there were lots of Miss Viv handbags. 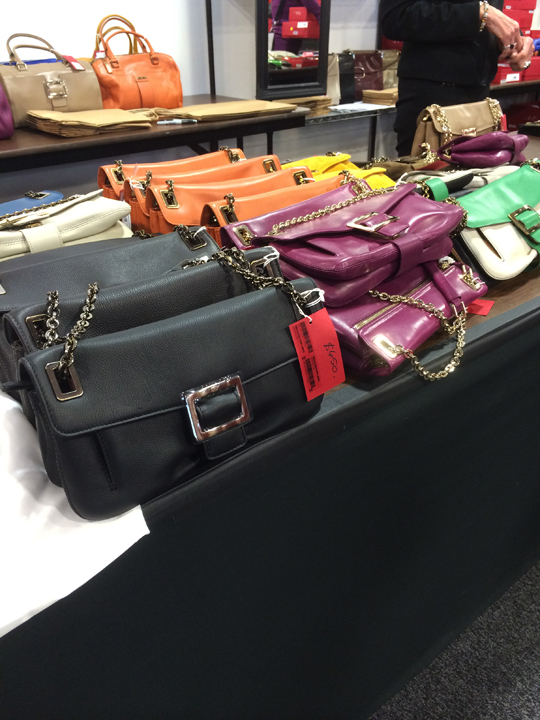 Miss Viv shoulder bags were priced between $750~$1,995 and were available in various colors like black patent (like this one), red, maroon, blue, and yellow (9th & 10th photo below). In addition, Miss Viv was also available in mini versions (suitable for evening occasions) with colors ranging from satin pink to chic black (14th photo below). Prices on mini Miss Viv were around $525. 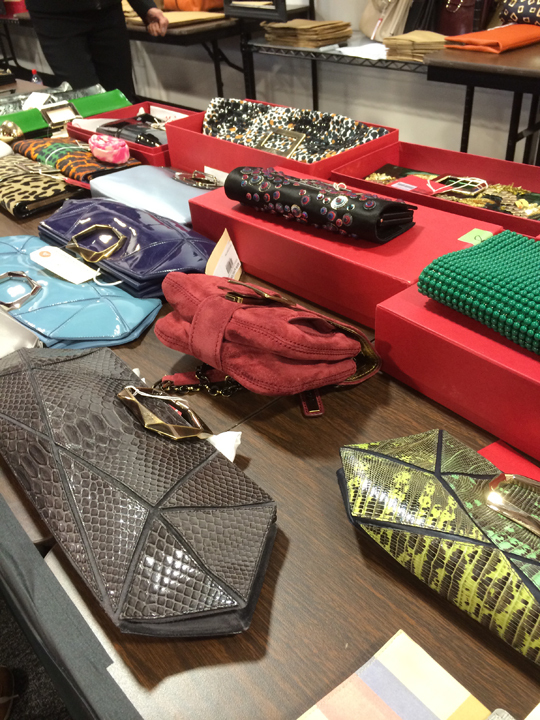 Other than the iconic Miss Vivs, prices for other handbags and clutches were $500~$875. 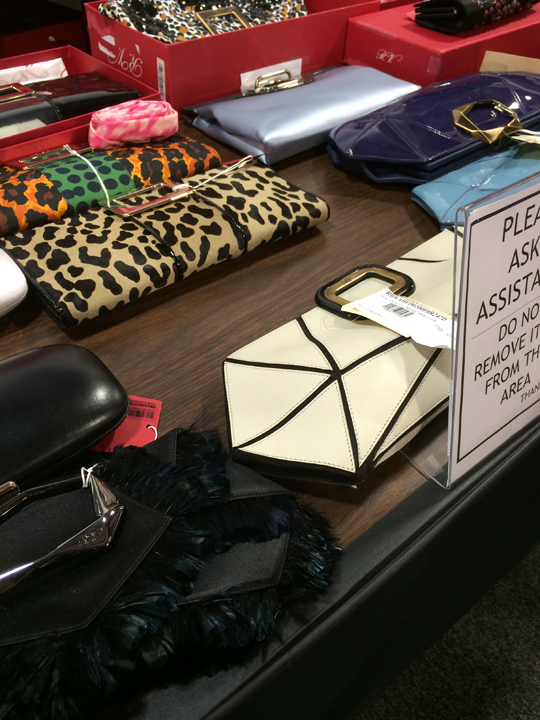 As for accessories, three long tables near the cash registers held a modest variety of wallets, gloves, belts, and jewelry. It took me less than a minute to browse and even that was too much time wasted. 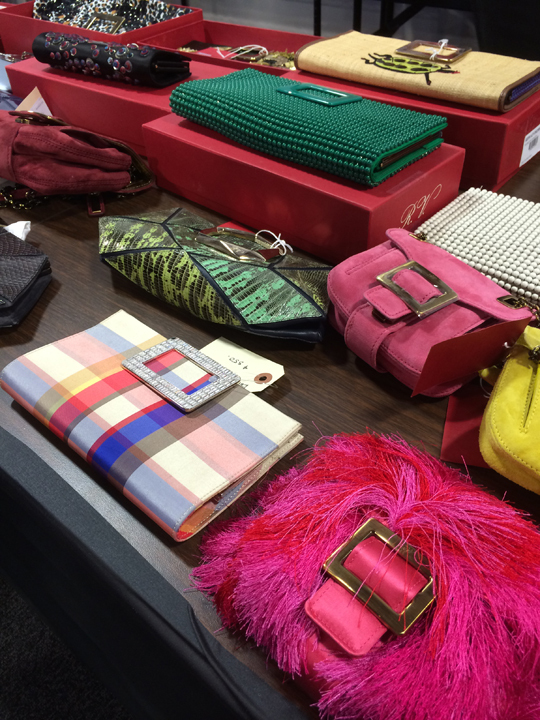 As much as I adore Roger Vivier and Inès de La Fressange's style, I would say this year's sale was not worth the time and certainly not worth the effort of braving several hours in the cold. There was practically nothing for sizes 38 and under and I was told merchandise would not be restocked. If you must, I would suggest checking out the handbag section when the crowds die down but this in itself isn't a stellar MizAdvice. Further reductions are highly unlikely but regardless I will make sure to keep you in the loop with any developing details. So check out the comment section below and feel free to drop a line to let me and your fellow Mizhattanites know how the sale panned out for you today. Thank you so much for your honest report! I believe they were 39. 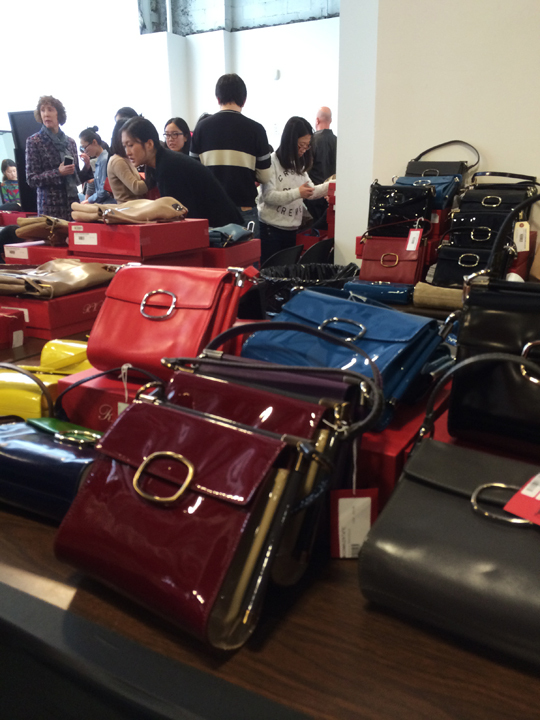 I went to the sale today and actually really enjoyed it. Fabulous prices for how beautiful and unique the pieces are and there was plenty to choose from in my size (39/40). I also appreciated how organized the sale was and how many people were there to help. 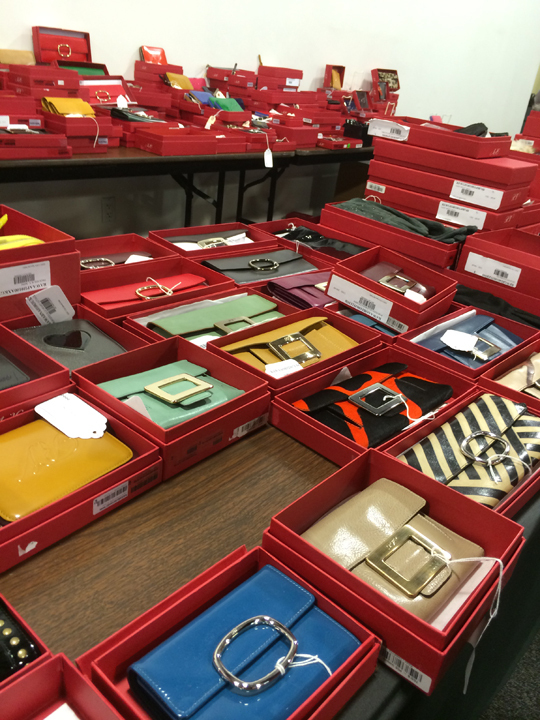 I consider myself a sample sale veteran and this is definitely my favorite every year. For me, this year proved to be no different. As always, thanks for your honest and thorough reviews! Lucky you! What did u get? Excellent report and pictures, as always! Thanks! Glad I didn't go this year. I can't believe they don't have anything at all in small sizes. That certainly is disappointing. I know. Many shoppers (including myself) were disappointed. Thank you for reading though. I went to the sale today and actually had a great time. I arrived at 9:30 and waited four hours before getting in...Although I was cold and wet, I met some really nice people on line. 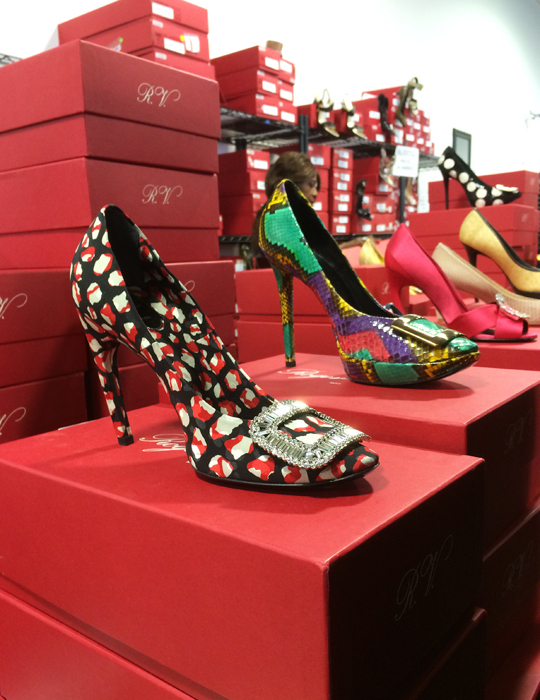 There were plenty of shoes everywhere...the selection was fabulous! I bought three pairs and am very happy:). Thanks so much for all the info and now I am waiting for the Loub sale:) Do you have an idea when? I'm glad you had a great time. The Louboutin sale should be in May. Miz, though I'm not a RV fan, I do love your reports and go by your word. I arrived at the sale today at about 5 pm. 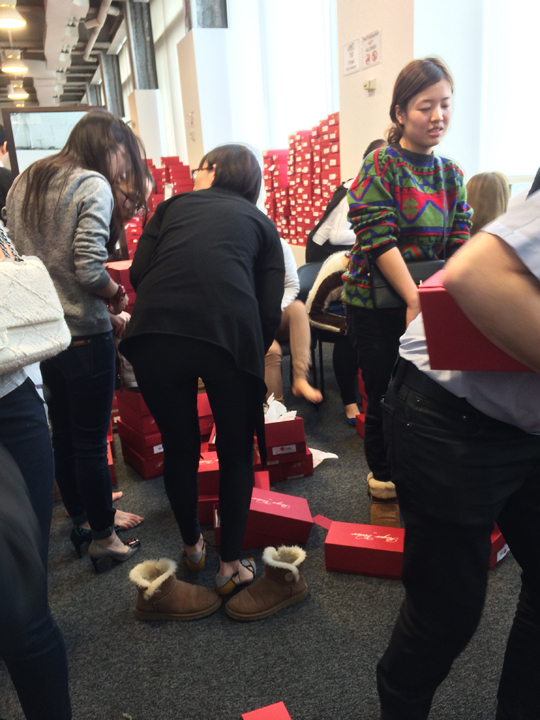 There was no line to get in and plenty of shoes available provided you wear a size 39 and up, as the post stated. I wear between a 39 and 40 and was also able to purchase a pair each for my sister-in-law and mother. Many of the more practical styles and colors had lower stock, but it is worth a stop tomorrow if you're in the size range. Thanks for the write up. I agree. It was an excellent sale for sizes 39 & up. 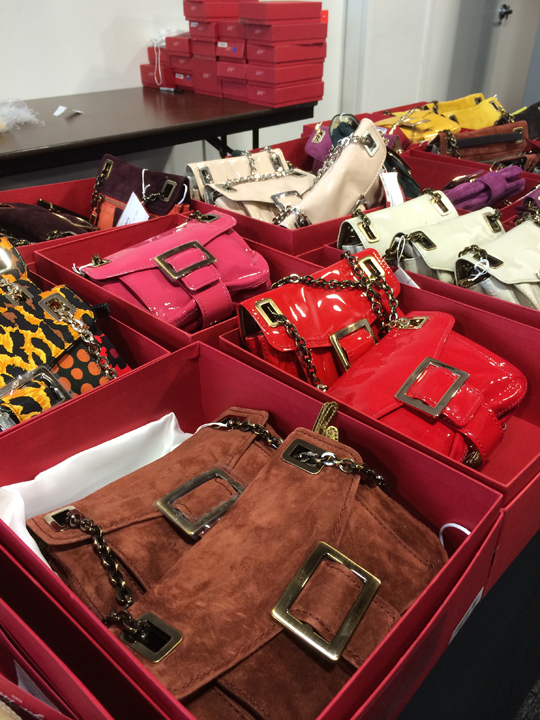 Is the roger Vivier sample sale once a year please?thanks in advance! Yes, it's an annual sale. Any update on what was left today at the sale? I was sadly out of town for my favorite sale of the year -- thinking of going tomorrow but not sure if it is worth it. 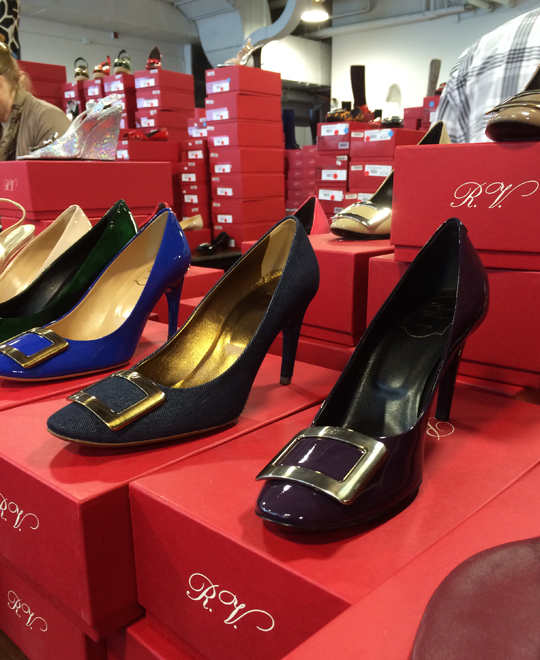 Size 39 1/2/40 -- interested in traditional styles like belle vivier, decolette belle -- flats/low heel. Thank you! 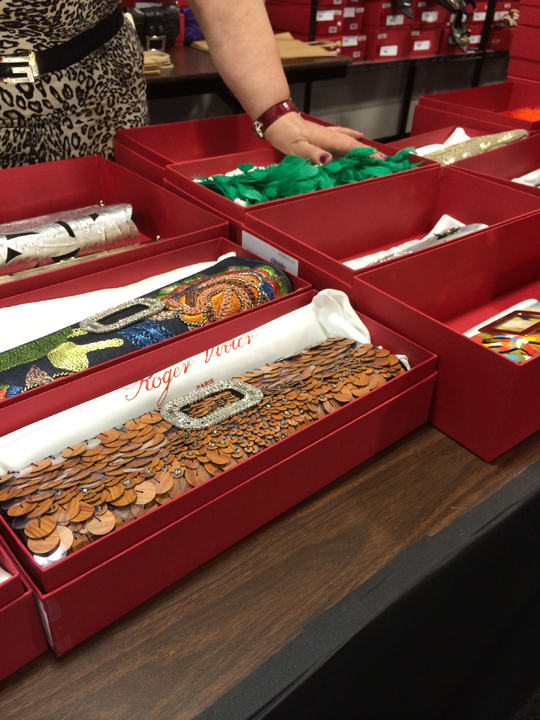 I was there today...very limited selection of the traditional buckle styles, mostly 40 and above. Mostly in less practical colors, i.e. pretty much no neutrals (I include dark blues/reds/metallics in this category). Practically no Chips, 25mm or 45mm Belle Viviers, or 60mm Belle de Nuit (which were the ones I was interested in) in any sizes. The one plus was there was no line so I zipped in and out quickly (didn't end up getting anything, but I'm a 38.5-39). Has there been any price reductions? Thank you! No further reductions but a new shipment has arrived. Wow. Thanks for the info. Any buckle style in the new shipment? Thank you! Any additions in smaller sizes? There are new buckles and a few smaller sizes. Hey....Miz...Love, Love, LOve YOUR reviews....going Tuesday...do you think any reductions....on bags...shoes. I am a sz 41? Hi Miz, will there be price reduction today? Thanks!